Leave it to the Olympic spirit to remind us all just how important teamwork can be for the success of just about anything. This week, as I’ve been glued to the TV watching coverage of the Summer Games, I’m constantly reminded of one of my favorite Olympic memories: watching Kerri Strug vault the U.S. Olympic gymnastics team into history at the 1996 Games in Atlanta. While it may have been Strug who got most of the spotlight that night, it was truly a team effort from each of the other six members who equally contributed to that magical evening where the “Magnificent Seven” took the Gold medal – and captured America’s hearts. It’s not too different in the business world. You’ll rarely find a successful business professional without a strong team behind them, and similarly, some of the most successful individuals will gladly admit that they are only as good as their team. Nobody exemplifies this more than one of my good industry friends, Jennifer Warawa. Jennifer always impresses me when she meets someone for the first time. Instead of introducing herself as VP of Partner Programs and Channel Sales for Sage, she modestly explains that she “looks after the Sage Accountants Network”. I’ve never heard her reference anyone “working for her” – but she’ll often mention those who are “on her team”. Her approach has enabled her to create a real sense of community within her team and within the accounting industry by eliminating any sense of superiority she would have over those of us who don’t have a VP in our title. It might be the Olympics getting to me, but I might also have teamwork on the brain as I wrap up my first month with my new team at XCM. When you join a new organization, you’re often at the mercy of your new teammates to help you get up to speed and to warn you about the land mines that loom ahead, in hopes that you’ll learn from their mistakes rather than have to make them yourself. I can’t begin to express how blessed I feel to be a part of such an amazing team, who has done just that for me. From my first few days in the office, the sense of teamwork and community at XCM was apparent. When this feeling of community is truly put into action, this will wind up impacting not only an organization itself, but also its extended ecosystem (partners, clients, prospects). 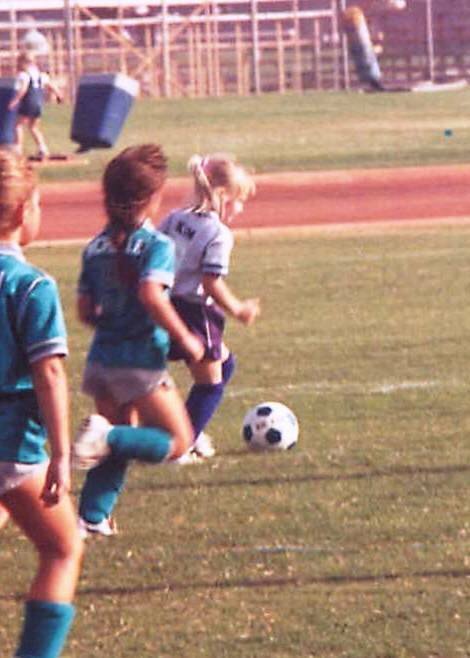 Believe it or not, before the 4” stilettos filled my closet, I used to sport a pair of soccer cleats. In all of my 10 years playing soccer growing up, I was never the most powerful player on the team, but one thing is for sure: I was a team player. One memory that I have all these years later is from an indirect free-kick scenario. While most people want to be the one to take these shots, to be the one to score the goal and get the glory for doing so, I knew that just wasn’t my role on the team. Thankfully, I also knew there is just as much value in being the set up person. So as my teammate lined up to shoot the ball into the goal (unaware that it wasn’t a direct kick, and that two players needed to touch the ball before a goal could be scored), I came running out of the backfield yelling at the top of my lungs. My antics worked. My teammate paused as I ran right up to the ball, tapped it, and yelled to her to shoot it. I turned around just in time to see her put that ball into the top left corner of the net. Of course my teammate got the high-fives for making the score, but I also got recognized for setting it up…after all, without the assist, the goal wouldn’t have counted in the first place. What’s the big lesson there? As many of us get caught up in climbing the corporate ladder and desperately trying to get ahead, we sometimes lose sight of what really matters – teamwork. Perhaps even more important is the realization that each and every member of a team has a purpose and a value. Sometimes it’s not just the folks on the front line that deserve the recognition, sometimes it’s those in the background, quietly doing their job so well, which in turn makes those of us in the spotlight look even better. So here’s to the amazing teams behind each leader. The Customer Service Managers who skillfully calm frustrated clients. The Support Reps who graciously answer each & every question from confused new employees. The Development teams who diligently work to add new features. And the most near & dear to my heart, the Managers who stand back and let their apprentices shine…knowing that their success is truly achieved through watching their handy work in action. One, Two, Three – GO TEAM! Whose Bright Idea was this Anyway? It’s amusing to me how things tend to fall into place sometimes. You can write a script all you want, and things never seem to turn out the way you plan them in your head (please tell me I’m not the only one who deals with this). Then when you least expect it somehow the stars all align and everything fits together perfectly. In a world where it seems everyone strives to make a name for themselves, most of us can relate to the feeling of trying to force things to work. As the only girl in a family with four children, I’ve somehow managed to pick up the stubborn gene to go with my over-achiever personality. I know I tend to get stuck in a rut where I’m determined to make something work, just so I don’t have to deal with the feeling of “giving up”. The thing I never seem to remember is that so often while I’m trying to fit that square peg into the round hole, there’s a perfect circle waiting just down another road. If you asked me six weeks ago if I’d be going by any name other than ScanSnapKim right now, I would have laughed…I mean, it wasn’t just my Twitter handle, this is what people called me in person. I was at least a wee bit committed to that identity. But here I am, digging into a new role with XCM – not to mention building a new name for myself and proudly representing the company I serve. It’s at a time or crossroad such as this where I tend to take a step back & look at things with a different perspective. As I did just that, I realized that while “ScanSnapKim” is (was) definitely a big part of who I am in the industry, it wasn’t (isn’t) necessarily what will leave a lasting impression. There’s no one person I can blame for my love affair with fancy footwear, although some of you (you know who you are, Dub-Dot) sure don’t help the cause. I assure you I never imagined (honestly, I didn’t) it would spiral this far out of control…but of course, had I written that into my master plan, perhaps it never would have happened. What started as a mere need to add a little color into my trade show wardrobe (and you too know who you are, Mr. Publicist), fast turned into my trademark – what people have come to expect from me, and have come to associate me with both in and outside of work. It dawned on me at that moment that this is what will leave that lasting mark, regardless of what my Twitter handle says. So while I didn’t plan it, or script it out – why argue? A few people have asked me what my purpose is with this blog – who is my target audience, what am I trying to tell people, etc. While my first reaction is to come up with some type of “workish” response, that sounds very premeditated & thoroughly thought out, in reality, It’s a lot like the whole shoe situation – something that just sort of came about all of a sudden, but why not run with it? I figure there are plenty of blogs out there (in addition to the mainstream media sites) where we can all go to get a Ron Baker headache, so I do promise we’ll never get that deep here. I also promise not to inundate you with endless photos and banter about Mr. Louboutin’s upcoming Fall line (ok, yes, there might me some shoe talk & even a few photos). Bottom line, I think every now & then we all need a light-hearted reality check, so at least for now, that’s what I’m doing here. In so many words, I guess I figured it would only be fitting to take my ignite presentation one step (pun intended) further and share some of my random thoughts, glorious travel experiences, personal victories, and professional lessons (some already learned and others still around the next corner) with everyone. So as I said in my first entry, I hope you’ll follow along with me as I give a glimpse into my world as I use my personal brand to make a difference every day…and hopefully one day leave a stiletto print in this industry. As I’m sure is the case with many road warriors like myself, I’m often asked the question “Where are you based?” My typical reply is “30,000 feet in the air”…I always get a chuckle from whoever asked. All in all, I have managed to outgrow some of my early career travel woes (maybe one day I will share the story of Webster, TX one June afternoon), but with as many frequent flier miles as I’ve been earning the past few years, days like I had last week are just bound to happen. To anyone outside of work, my life on the road is exciting & glamorous “Wow, a week in Las Vegas – how fun!” Then I help explain that most of the events I attend could very well be held in Fargo (which, actually has happened), or Omaha and it would be exactly the same experience: airplane, taxi, hotel, conference room, trade-show food, late nights, early mornings, taxi, airplane. 6:27am PDT – Orange County, CA: Wide awake before my alarm…of course I didn’t sleep well last night, constantly waking up to grab my phone in a panic – convinced I had overslept and missed my flight. Since I’m up, I might as well check a few last minute “to-dos” off my list before my 8:45am flight. First stop: Javatinis, for my morning Iced Coffee fix. Thanks to the caffeine jolt, my morning went well and I’m at the airport in plenty of time (translation: left the house about an hour before my flight, prayed the whole way here that I would not hit traffic & would breeze through the new bizarre security line at SNA airport. It worked, barely. ), absolutely thrilled to finally be en route to Boston to start this new chapter with XCM. 7:55pm CDT – Houston, TX: Missed all flights to Boston for the evening, and I’ve just missed the last flight which would connect to a Boston red-eye…it’s going to be a LONG night! 10:00pm CDT – Houston, TX: Found a flight to Newark, NJ (after a mad dash, a near riot at the gate, a missing Drivers License scare, and an hour more delay on the ground). I’m finally heading a little closer to my first day in the office. 2:53am EDT – Newark, NJ: Arrive at the airport hotel & get a room for 2 hours – at least I can get some work done, shower, and change…isn’t this how everyone prepares for their first day? 7:15am EDT – Boston, MA: Arrived early and I just ordered my “6 espresso shots over ice” which will have to power me for the next few hours. Next stop: 639 Granite Street! 8:00am EDT- Braintree, MA: (ok, I’m lying, it’s actually 8:06): As I pull up to the XCM/ Xpitax office, I suddenly don’t care that I’ve been up for the past 23 hours, or that I’ve only eaten a protein bar since yesterday’s breakfast, or that I have a full day of work ahead of me. I’m feeling a lot like Dorothy in The Wizard of Oz as she opens the door into Oz – everything seems to go from black & white to color – wicked-good Orange to be exact! 1:27am – Quinsy, MA: I’m not at the Westin, but I assure you, never in my life have I seen a bed so heavenly. In the past 40 hours I’ve survived 4 flights, earned 3,000 United MileagePlus miles, spent an amazing first day in the office, and have been treated by my new team to a wonderful welcome dinner overlooking Boston at sunset. I think it’s safe to say that I earned my Road Warrior status today (well, yesterday really)…closing my eyes at last, good night! I won’t lie. I basically hate change. No, I’m not talking about footwear – for those of you who know me, that may be the only thing in my life that I prefer changes daily (or even hourly). But when it comes to most things in my personal and especially in my professional life, I’m much more content when things are “normal”, “comfortable”, and “routine”. That’s right, I’m pretty boring after all. I can’t even count how many times my mom and I have had the same conversation whenever things change…thank goodness for moms! She always reminds me that things always turn out better in the end, and that there’s always something more exciting down the road – and, of course, I always shrug and agree that as usual, she’s right. While there’s nothing really wrong with being comfortable with a routine or getting into a groove, the danger that lurks with letting too much time go by without new changes is that of complacency. It’s really easy to sit back and get comfortable with the security of “normal”. Sadly, it’s easy to miss amazing opportunities to challenge and grow. With all that being said, every once in a while one of those opportunity comes along where the excitement outweighs the anxiety of change. Today marks one of those times for me with a huge change in my professional life – as I have just left Fujitsu for a new opportunity. Some might say that I’m “hanging up my ScanSnap hat” – but we all know that it isn’t my hats that get so much attention. Thats right, if ever an official Twitter handle funeral was in order, it would be about now. So yes, I’m leaving @ScanSnapKim behind, and have picked up a Boston accent to go with my new identity, @XCMkim. But rest assured, I’m keeping my SoCal zip code and ALL of my shoes as I begin this new adventure of this wild (or should I say wicked?) ride. I’m so proud to announce today, that I’ve joined XCM Solutions, the premier provider of wicked-good workflow solutions to accounting firms, as Director of West Coast Operations. Over the past several years I’ve had the privilege of trotting the globe (in 4″ heels) as an evangelist for the best scanners in the world – and I’ve had an absolute blast! So now as I take a step into this new chapter, I’m excited to know that I’ll continue to see and work with so many of my friends that I’ve been blessed to meet over the years. I decided that now is as good a time as ever to embark on this new adventure as well, with the launch of my own blog. I would never ask anyone to walk a mile in 4″ stilettos, but I do hope you’ll all follow along with me as I take this walk…I’ll give you a View From My Shoes.